Muscle loss begins at a relatively young age and continues with time, so it is important to take steps to help maintain muscle mass. While daily exercise and staying active are essential for maintaining muscle strength, additional support is always useful. That is where Clinical Strength Muscle Support comes in. It is designed to help support aging muscles, so you can maintain your active and healthy lifestyle for years to come. 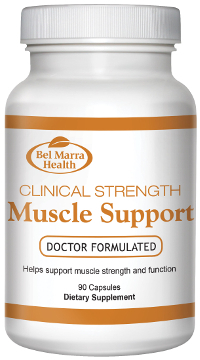 Clinical Strength Muscle Support uses the powerful Tongkat ali extract LJ100®, which helps enhance physical performance, muscle strength, and energy. It also includes five compounds (carnitine, vitamin D, vitamin E, leucine, and magnesium) that boost muscle strength and performance. Strong muscles are essential for simple everyday tasks such as walking around town, opening jars, and even getting up from a chair. That's why it is extremely important to help promote and maintain strong and healthy muscles as time goes on. *LJ100® is a registered trademark of HP Ingredients. WARNINGS If you are pregnant or breastfeeding, consult a healthcare practitioner prior to use. If you are taking hormone replacement therapy, have a liver disease, a kidney disease, or a seizure disorder, consult a healthcare practitioner prior to use. Ensure to drink enough fluid before, during, and after exercise. DIRECTIONS Take three capsules daily, or as directed by health care practitioner. Take 2-4 hours prior to exercise. Do not use if inner seal is broken. Take up to of 6 capsules daily.